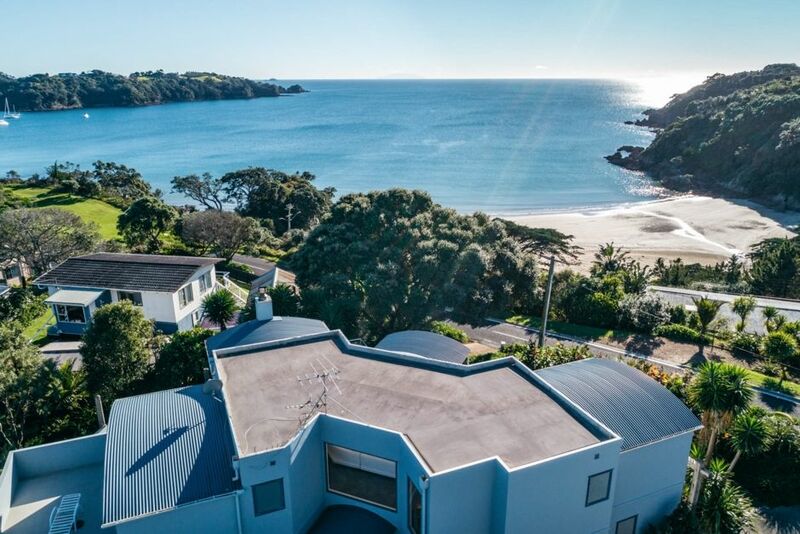 Large family holiday home close to Little Oneroa beach, with great views! Casa on Tawa is the perfect holiday house! It is large and sunny with plenty of room for family and friends, with great views and a few minutes walk to Oneroa Village and the beach. The sunny north facing property overlooks Oneroa Bay, with Little Oneroa Beach just around the corner. A few minutes walk takes you to Oneroa Village with lots of cafes and shops to explore, and Oneroa Beach as well. The house is spread out over 2 floors. The bottom floor has a large open plan living, dining / kitchen area, with a lovely sunny north facing deck and fabulous views! It has lovely high ceilings, a well equipped kitchen, and indoor/ outdoor dining areas which makes this a great house for entertaining. There is one bedroom on the ground floor, with an ensuite. This has lovely views and opens opens onto the main deck as well. There is also a further family bathroom, and a side deck with a BBQ and outdoor dining table. On the upper level there are 3 further bedrooms. The master bedroom has a splittable Super-King bed. Adjacent to this is a double bedroom, and these rooms share an ensuite. There is also a further guest bedroom, with a queen bed, and an ensuite. There is also a open mezzanine style living area, perfect for relaxing and enjoying a good book, or just chill out watching TV on the flat screen. This upstairs area opens up onto a further large deck space. Casa on Tawa is ideally located - wander down to the beach, walk into Oneroa or catch a bus to explore further afield. Within 15 minutes drive are dozens of wineries, plenty of fabulous beaches and cafes, as well as a 9 hole golf course. All bookings incur a one time linen and exit cleaning cost of $250 so you have nothing to do but relax, refresh and enjoy. Casa on Tawa is ideally located in a quiet residential neighbourhood, with Oneroa Village just down the road. Wander down to the beach, walk into Oneroa or catch a bus to explore further afield. Within 15 minutes drive are dozens of wineries, plenty of fabulous beaches & cafes, as well as a 9 hole golf course.